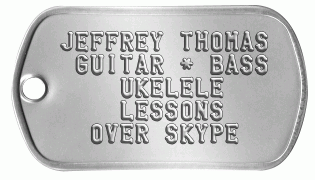 Patrons of jeffrey-thomas.com who take one free guitar, bass, or ukelele lesson over skype will receive a free customizable mil-spec dogtag from MyDogtag.com. Makes an ideal ID tag for attaching to your guitar case or amp! You must first take one free guitar, bass, or ukelele lesson over skype via jeffrey-thomas.com to obtain your unique promotional coupon code. If you decide to purchase additional items with your jeffrey-thomas.com dogtag, a flat rate shipping fee of $5 will be applied. Make your FREE 'jeffrey-thomas.com' Dogtag Now!